Grinding (with diamond abrasives) removes lippage (uneven tiles), deep scratches, and makes surface flat. Honing removes small and medium scratches and etching from acidic or high alkaline substances before polishing. Honing also can produce a nice matte finish if so desired. 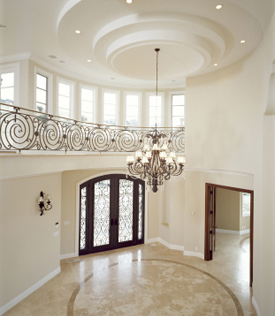 Polishing restores shine and luster to marble, travertine, limestone and granite. Repairs chips, cracks, grout, filling of holes in travertine, caulking. Replacement of tiles. Deep cleaning removes deeply embedded dirt from stone and grout. Sealing restricts water, oil, and dirt from entering the stone.